I recently returned from a photo trip to eastern China and wanted to share a few impressions of that part of the country and tips on China travel. When planning your trip, you’ll not only need a passport, but also a visa to enter the country. You can apply for a visa online through an agency, and it isn’t that difficult. (I applied for a 10-year visa.) The other thing you’ll need to know is that it’s illegal for foreigners to drive in China, so even if you’re flying or taking the train, you’ll eventually need a guide to drive you where you’re going. We traveled with a small group of photographers to keep prices lower and to be more flexible than traveling with a large tour group. Timing is important too—we arrived in October which is a good month for weather, and we also arrived after the National Holiday celebrating the formation of the People’s Republic of China in order to avoid the crowds. 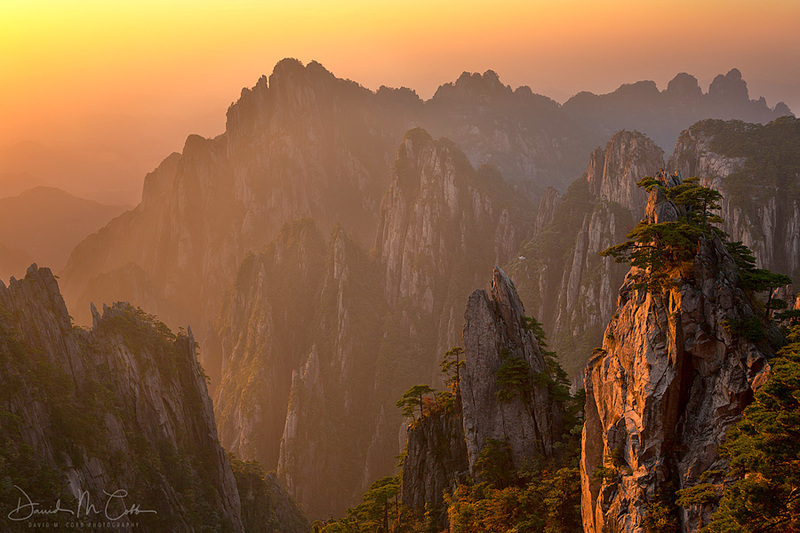 Given that, and that it’s off-season, it’s still quite crowded in China’s National Parks. 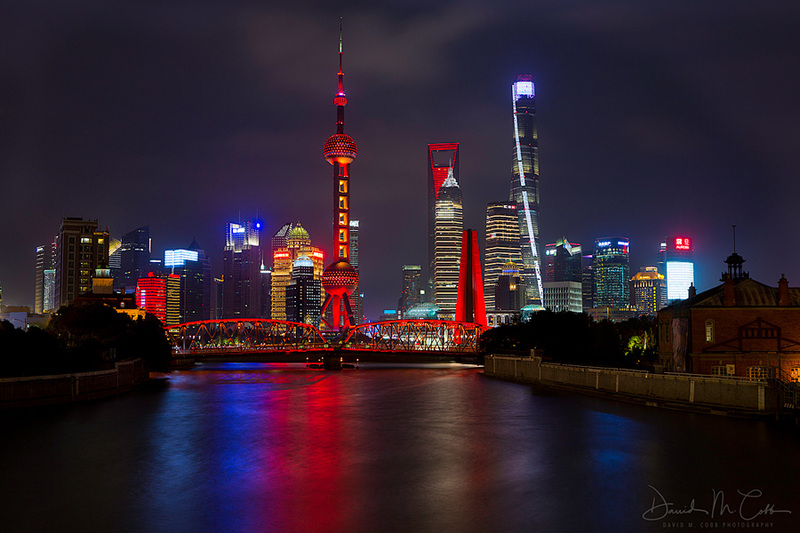 The first days were spent in Shanghai photographing people on the streets, in gardens, and at temples, as well as photographing the city skyline and the view from the top of the Shanghai Tower–the second highest building in the world. 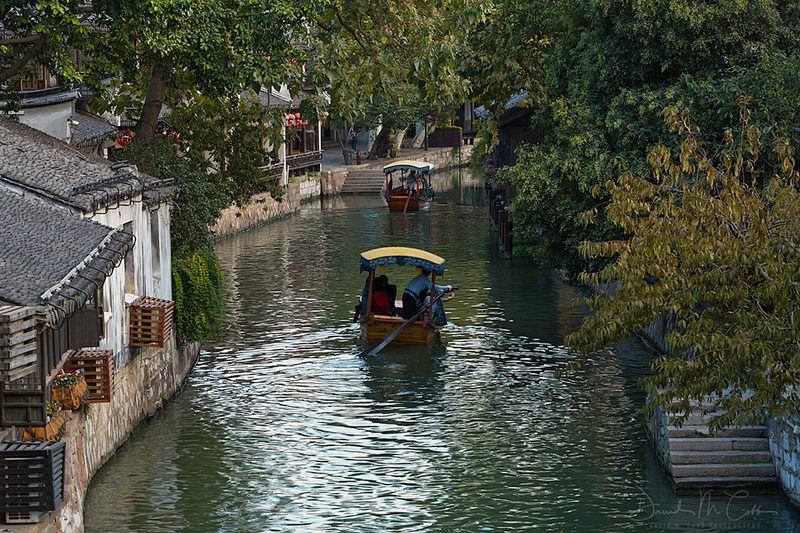 On the outskirts of Shanghai there are numerous water towns, which are like Venice with their canals and gondolas, but far less crowded. There are more touristy water towns, but we chose the less touristy and more authentic ones in Nanxun and Tangmo. There are many things to photograph in these towns, and cities are fine for a while, but I was really looking forward to shooting in mountains. From the Shanghai train station, we took a highspeed train to the Yellow Mountains and arrived at the mountain’s base. 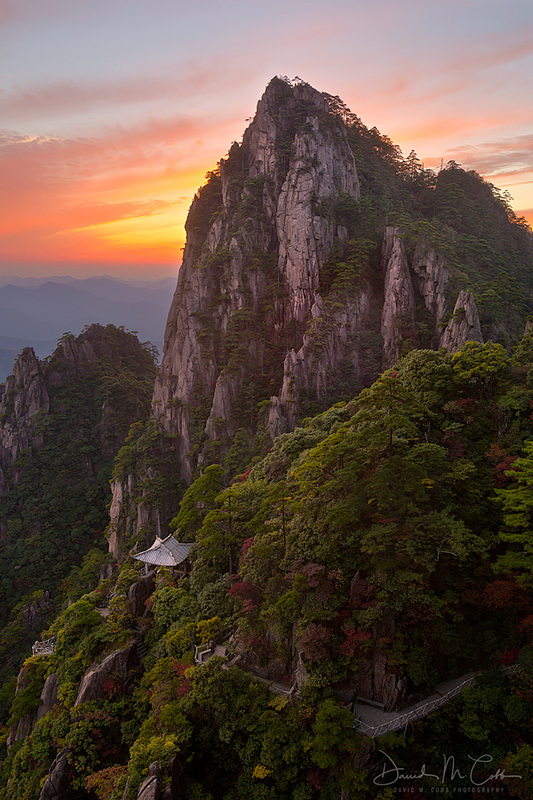 A morning tram took us almost to the top, and although the Huangshan peak is only 1,900 meters high the spires and pinnacles make it seem much higher and more rugged. We left our suitcases behind and packed only the essentials we could carry on our backs for the next few days. After exiting our tram it was a 2 kilometer walk to our lodge, where we’d stay and photograph the mountains at sunrise and sunset. The afternoon crowds were relentless, and the megaphones blaring gave me a daily headache. Sunrise and sunset were devoid of people however, and this was the time I chose to spend outdoors. The trails up here are all paved, and stairs are everywhere. I’m used to hiking trails, but the endless number of stairs are kind of a pain. Still, the engineering it took to build some of these paths along the cliffs is quite amazing and sometimes unsettling. 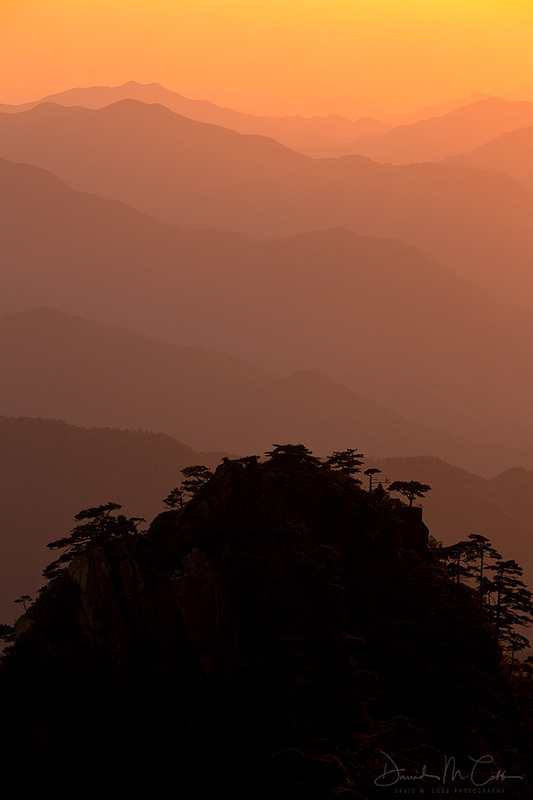 We didn’t make it to every nook and cranny up in the Huangshan Mountains and the guide needed some training about what we wanted to photograph and that we didn’t need to see the sun for sunset and sunrise. We did well however and had some great light while we were there. From the mountains we headed back to the city for a bit, to see the area of West Lake in the city of Hangzhou. I read that West Lake was one of the “do not miss” places in China, so we didn’t miss it. West Lake is a big city park which reminds me of Central Park in New York, so it didn’t really do it for me. The gardens were nice, and I took a few shots, but my time could have been spent elsewhere. I think if you’re from China, West Lake means a lot more to you, but since I’m not, it didn’t. The surrounding tea plantations were fun to visit and viewing the making of tea was interesting to me. That said, I was ready to return to the mountains. A two-hour flight took us to the city of Zhangjiajie, and a short drive from there took us to Wulingyuan National Park. The next morning, we took another tram to the top of the mountains and stayed at a small lodge here. The Wulingyuan Mountains are a UNESCO World Heritage Site, so these lodges within the park are being shut down by the government. In the coming years it may be more difficult to view sunrise and sunset from above. 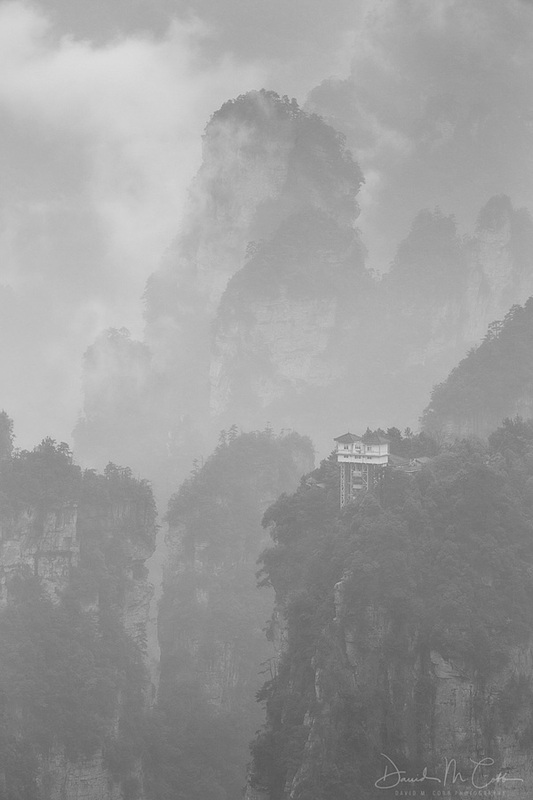 The Wulingyuan Mountains are truly impressive given the canyons full of sandstone pillars and mist. If you’ve seen the movie Avatar, then you’ve seen these mountains. There are numerous lookouts here, so it was easy hiking to viewpoints for sunrise and sunset. The owners of our lodge also helped with transportation, and the bus system in the park is decent. I could probably have spent a month here photographing, but I only had a couple of days, which was far too short a time for such a spectacular place. Returning to town we then took another tram (7.5 kilometers) to the holy Tianmen Mountains. These mountains have an incredibly large arch and are also known for the plexiglass pathway along a cliff. Walking on plexiglass with a 1,500 meter drop below is a bit disconcerting, but I did it. The light was crap here and the trails were overrun with people, but I experienced them. I wanted to spend more time in China and had planned on it, but prior engagements sent me home. I missed the panda bears to the far west and the high western mountains too. I plan to return, maybe next time to the less-visited deserts of the north and west which resemble the slot canyons and lands of the Colorado Plateau in Utah.